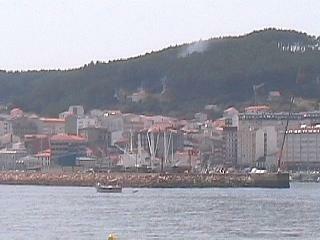 Ribeira's port is at the most westerly point of the Barbanza peninsula and faces open sea. Below, a distant shot showing one section of the port. The harbour has deep water and is suitable for fishing vessels of all sizes including the factory ships that not only catch, but partially process the fish. Its position also makes it amenable not just to local fishing, but also long hall fishing to both the northern and southern Atlantic ocean as far as Argentina. In days gone by, some of these excursions could last as long as seven months for a single outing. Ribeira's fishing fleet is actually the third largest in the whole of Spain. It lands catches of pretty much every kind of fish than can be boiled, baked, fried or grilled. That said, sardines are the fish for which this port was once especially famous and it traded them with both neighbouring Spanish towns and also centers in France as well. Ribeira's inshore harbour is regarded as the most important in Spain and has a large market which auctions the daily catch as it is unloaded every evening. 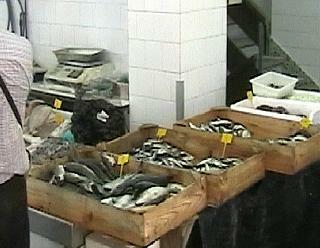 below, fish for sale in the market. Catches from nearby ports, including Porto do Son, are also brought to Ribeira for auctioning, although today details of the catch are forwarded to the market before their arrival, ensuring that buyers are established before the catch actually arrives. If you want to see a real fishing town, a real fish market and a community that is still very dependant upon the sea and its treasures, then Ribeira will not disappoint. However, access to the main area of the commercial port with the larger vessels is restricted. An alternative is the large port at a Pobra do Caraminal. Ribeira also has some great beaches to the side of the main town. A little bit of reminiscing for a moment! 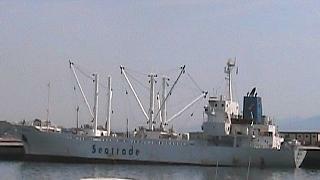 When I was a child in the late sixties/early seventies, Britain had the largest fishing fleet in Europe (before French and German EU policies destroyed it completely) and I can remember fishermen, from what was then the premier sea port in Europe, Hull, coming to my school and showing us some cine reel film of the port and boats there. When I first saw Ribeira, the images of the boats, the Key and the general scale of what was on display, reminded me of those images 30 plus years earlier.